Invite your friends and relatives to an exclusive, intimate presentation of the latest in Jewish music in your very own home. Continue in the centuries-old tradition of parlor concerts in the home setting. Sharim v’Sharot is available at reasonable rates for a private house concert. 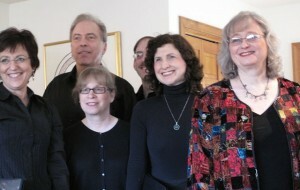 We have sung in house concerts throughout the Delaware Valley. Our last House Concert was held in Bucks County in January 2018. Contact us at (609) 22-CHOIR to be the hosts of the next house concert!